The Spanish word for tile, ‘azulejo’, is derived from the Arabic word, الزليج (az-zulayj) meaning “polished stone”. This origin explains the unmistakable Arab influences in many modern Spanish tiles, which interlock curvilinear, geometric or floral motifs. 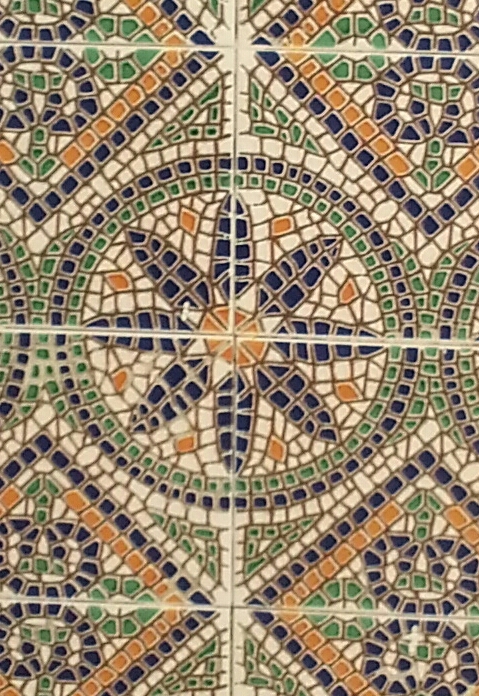 In the 15th century, cities in the south of Spain, a region called, Andalusia, became the major centre of the tile industry, employing the ancient craft passed on through generations. The original tiles were glazed in a single colour and decorated with geometric patterns. They were applied on walls and used for paving floors. Islamic artists and craftsmen who worked in cities such as Cordoba, Granada, and Seville, from the 8th to the 15th centuries, crafted these tiles Based on eight geometric patterns. The mosaics were handmade with many different-shaped pieces which all fit together. It is believed that the origin of the designs came out of artistic limitations for Muslims, who by strict Islamic law were not allowed to depict living beings and therefore expressed their art through shapes, colours, or the words of the Coran. The traditional colours used were, brown, green, white, saffron, blue and black, which had symbolic meaning in Islam. White, black and brown symbolized the spirit under Sufi imagery. The 4 elements were represented by Red for fire, dry and hot, yellow for air, moist and hot, blue for earth, dry and cold, green for water, moist and cold. Contemplating the tiles inspired the viewer into a meditation which often had religious implications. Master craftsmen would be apprenticed from a young age and learn how to design and create grand mosaics with the tiles. 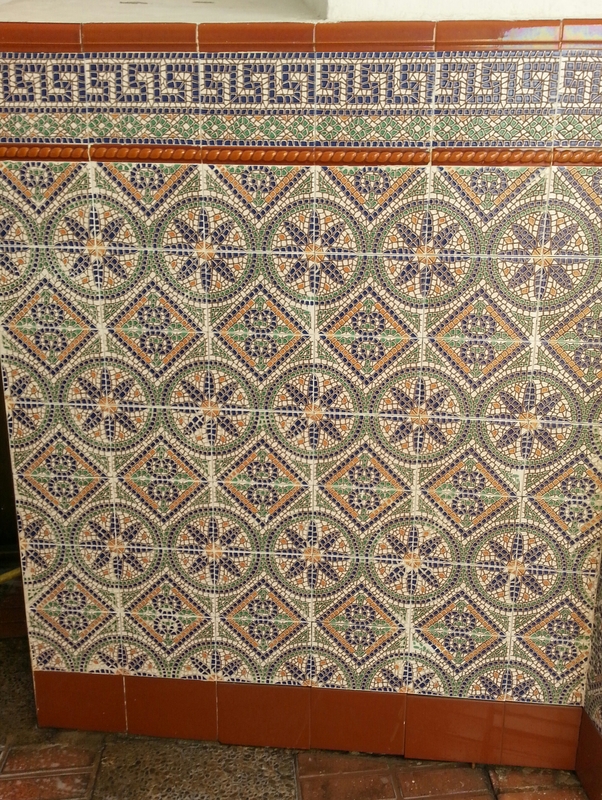 The use of these tiles became a symbol of sophistication and wealth in many homes. During the Marinid dynasty in 13th-15th century Morocco, it was also used in ornamenting walls, fountains, tables, floors, countertops, ceilings, and sometimes even entire mosques. The overlaps between Moorish and Spanish, Islamic and Christian are evident to anyone who visits many ancient buildings, gardens and palaces of southern Spain. This mixed art form of Moorish art combined with the Christian culture, is called the Mudejar style. The Alcazar of Sevilla, the Alhambra Palace, and the Mosque in Cordoba, include some magnificent examples. There are also similar examples of Moorish style tiles in Portugal, and Italy. 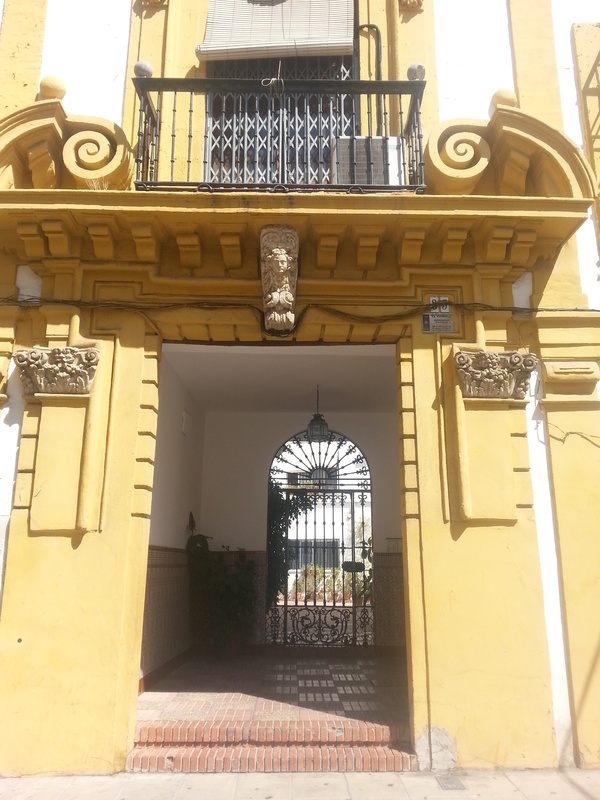 The tiles I have chosen in the picture decorate the lower part of the wall of the entrance to this beautiful 18th century building, which was a palace, and is now divided into many small apartments, for sale or rent. These tiles have a clearly Christian influence because they include floral motifs, which are not found in Islamic art.